with the excellence of the Swiss made Dubois-Depraz movement. 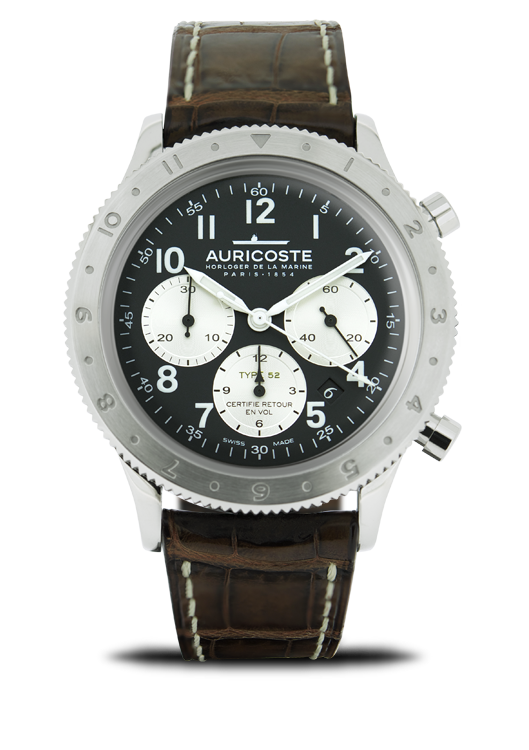 Our Type 52 chronograph features three counters is our answer to those who want both a miltary and sport watch. It makes this watch a multi-complication time keeper: third counter at 6, date between 4 and 5 and tachymeter bezel.The case and the bezel have been designed in a perfect 316L steel. Size: 42mm. The watch feature a genuine alligator strap and a steel deployment clasp. The movement is a Dubois-Depraz self-winding mechanical Flyback certified, 57 jewels and a 52 hours power-reserve.